The GR-7 long-distance walking trail links the attractive Lecrín Valley villages of Melegís and Murchas. This walk takes you up from Melegís to Murchas on the GR-7, before returning by a differrent route to make an easy and pleasant circuit. Level: Very easy – suitable for people of all ages and levels of fitness. 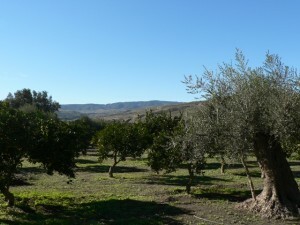 When to go All year round, but a particularly good option in winter – due to the Lecrín Valley’s agreeable micro-climate, the weather here tends to be much milder than in other inland parts of Granada province. The walk starts from Melegís, one of the white villages of the Lecrín Valley. By car: From Granada take the E-902/A-44 towards Motríl. Come off at junction 160, marked Lecrín El Valle. 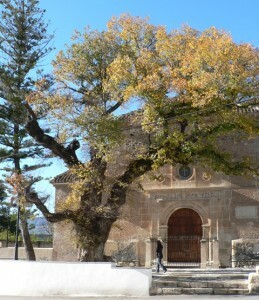 Pass the turning for Mondújar, keeping right on the main road. Turn left at the roundabout. After a few hundred metres you will see a small BP garage on the left – turn right about 100m past this, following signs to Restábal, Melegís and Albuñuelas. After about 3km you’ll get to Melegís. Immediately after the road turns quite sharply to the right, look out for Calle Molino Bajo on your right. Park beside the road here. By bus: Take the Alsa bus service from Granada bus station. There are 5 buses a day to Melegís on Monday-Friday and 1 a day on Saturdays (1 hour – 1hr 15 min). Click here for more info and links to current timetables. This entry was posted in 0-3 hours, Accessible by Public Transport, All Hikes, Autumn, Hikes, Lecrín Valley, Spring, Summer, Winter and tagged GR7. Bookmark the permalink.